The Pediatric Cardiac Intensive Care Unit (PCICU) is located on the tenth floor of the Patient Services Building. The unit is composed of 22 private patient rooms arranged on the east, west, and north hallways. A special therapy/cardiac rehabilitation room is also incorporated within the patient care unit. The unit opened in January, 2014. A central nursing station provides workspace for the health care team. Clean holdings, soiled holding, nourishment room, and equipment rooms are strategically located on the hallways. A 24-hour satellite pharmacy located on the 10th floor supports the unit. Three of the 22 bedspaces are designed for strict and respiratory isolation with negative airflow. The remaining bedspaces are equipped with clean/neutral airflow. Each bedspace is constructed with glass-sliding entrance doors and charting areas framed with abutted glass. Bedside monitoring including heart rate, respiratory rate, blood pressure, temperature, and pulse oximetry are standard. Expanded monitoring of invasive pressures, end tidal CO2, and mechanical ventilation are also available as the patient’s condition warrants. In addition, advanced monitoring and therapies including extracorporeal membrane oxygenation (ECMO), ventricular assist devices (VAD), total artificial heart (t-AH) devices, brain tissue oxygenation, and regional oximetry are provided as needed. A family room sponsored by Ronald McDonald House is located outside the unit as well as a traditional waiting area to provide families with a place to relax, prepare and eat meals, contact family members, and sleep in the hospital if necessary. The PCICU provides intermediate and critical care services for children from the newborn period through young adulthood twenty-four hours per day, seven days per week. The referral base extends from the lower Southeast to South Florida. 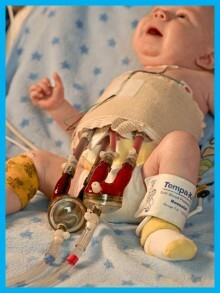 Patients are admitted by the Congenital Heart Center service. The nursing staff is committed to family-centered and innovative patient care through the assessment, diagnosis, planning, treatment and evaluation of: pain, fluid and electrolyte abnormalities, hemodynamic instability, alteration in neurologic status, respiratory compromise, impairment in skin integrity, developmental delay, and family anxiety related to the intensive care experience. The PCICU role specific job descriptions identify the patient populations, clinical parameters monitored, safety precautions initiated, and emergency events encountered. The multidisciplinary health care team cares for patients with congenital and acquired cardiac diseases. The length of stay is influenced by a complement of long term technology dependent children and recovery of pre and post-operative surgical patients. The most common diagnoses include, but are not limited to, those related to surgical palliation of congenital cardiac malformations, cardiac failure requiring transplantation, and various arrhythmias. A multidisciplinary approach is utilized to provide intensive and comprehensive care. Multidisciplinary, comprehensive care of our Congenital Heart patients and families is provided by Surgery, Medicine, Nursing, Social Work Services, Child Life, Case Management, Pastoral Care, Food and Nutritional Services, satellite-based Pharmacists, and other health care providers as indicated by the patient’s health status and identified needs. A hospital-based school teacher from the Alachua County School Board is available during the school year to work with children requiring repeated or extended hospitalizations. Weekly multidisciplinary conferences provide a forum for sharing assessments and planning care needs for each patient. These discussions provide the data for a more in-depth look at short and long term goals for each patient. Registered nurses deliver autonomous, accountable total nursing care to all patients on a 24-hour/7 days per week basis and are assisted by support technicians. Additional staff who provide support to the PCICU include pediatric clinicians, transplant coordinators, and ARNPs who work with pediatric critical care medicine, cardio-thoracic surgery, and transplant patients. Respiratory and ventilator care is provided by respiratory therapists trained in pediatrics. Registered nurses in PCICU meet the basic requirements for Registered Nurse staff and function in accordance with the unit-based job description, as described in the Hospital Plan for Nursing Care. Additional unit requirements for registered nurses to prepare them to care for critically ill children are met through an extensive orientation program. Following orientation, specific additional educational objectives are met by the end of the probationary period and annually. Nurses are expected to demonstrate a positive attitude toward family-centered care, and the ability, willingness, and interest to work with the age-appropriate and developmental needs of patients. Support Technicians meet the basic requirements for their positions and function in accordance with their unit-based job description, as described in the Hospital Plan for Nursing Care. Additional unit requirements for support technicians include having a positive attitude toward family-centered care.